Earlier in the week, we ran an exclusive interview with Neil Holloway, Vice President of Microsoft's international business. Speaking at the recent Microsoft Innovation day in Brussels, Holloway talked with TechRadar in-depth about Windows 7, Windows Mobile and Microsoft's plans for major R&D investment in Europe. But when asked to pick out his standout tech from the event, Holloway was quick to point to Microsoft Surface, recently officially announced in the UK at an £8,500 price point. "One device which I think [gets] people to think differently is Surface," he says. "Whether that's used for health or in the living room, it starts changing the way people interact. So long we've all been used to interacting through the keyboard. Now there's touch and a bit of speech flowing around. Over the next five years how we interact with these devices is going to fundamentally change. "What we'd love to see is [more companies] writing applications for it so people don't see it as kind of a coffee table," continues Holloway. "When you can start bringing in specific applications in health or in financial institutions… there's a great opportunity. We're not forecasting any particular numbers but this is being to be a transformation in how people should think about different devices. Holloway says Microsoft will grow Surface's install base, but doesn't want to go too far, too soon. "It's [going] to take a bit of time to commercialise so we want to make sure it can scale. Doing 50,000 units is a bit different from [managing] 5 million or 50 million over a period of time. "[It's about] making sure we've got the right infrastructure." At a recent event in London, Microsoft has confirmed its £8,500 price-tag for each Surface PC table, as it showed off UK partnerships with Tesco Wine Club, First Direct and Carphone Warehouse. The Redmond tech giant had previously suggested to TechRadar back at the BETT conference that it would be charging £8,500 for schools, and the European price was given at €11,000. 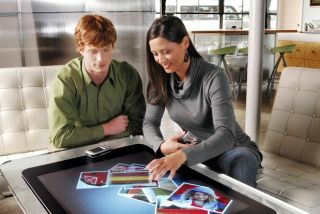 Microsoft Surface was first trialled by the company back in 2007. The technology has been impressing TechRadar at various shows across the world since, and has already become a hit in the US, after launching in Sheraton hotels.